The leaders of nineteen of the world’s most powerful nations are meeting this week in North Korea at the G-20 summit. 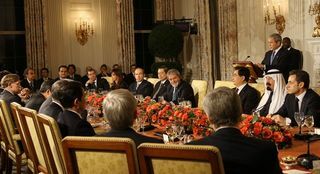 They’re negotiating about international financial stability, trade, currency, and shared responsibilities. With the worst economic situation in decades tensions are high and risks are enormous, and the United States comes to the table after making new regulatory moves that have many nations concerned. In the midst of international and domestic upheaval, great changes are undeniably warranted. The scary part is: summits like this are notorious for not accomplishing much. This morning, Time, released a report entitled “Pessimism pervades at the G-20 summit.” Scary, right? At a time like this, as a nation and a world we cannot afford “cat fights” between our most powerful leaders. We should be able to do better, and there are ways we can – if we can admit that the old approaches to international cooperation are often ineffective and commit to a new approach. Given the vastly conflicting interests, countries from the top twenty nations need to adopt a “process consultation” that allows for dialogue and exchange of ideas toward desired goals and outcomes. Edgar Schein, known for his work in organizational systems and group processes, is widely acclaimed for his theory of process consultation. Schein, educated in both psychology and business, speaks to ten core principles that must exist to effectively help remedy issues in business, government, and society. Schein’s theoretical principles are based on a core belief that engenders a facilitative process between the consultant and the individual or group seeking a remedy to an issue. For Schein, the individual or group seeking help is an active part of the diagnostic and interventional process; as responsibility and subsequent action ultimately flow through them. Always stay in touch with the current reality: the reality of the inner and external worlds of the consultant and the “group seeking help” must be embedded in the “here and now” context. Access your ignorance—the consultant must always be readily able to distinguish the difference between concrete knowledge and assumed knowledge. Everything you do is an intervention—every group process encounter has an effect; therefore goals and actions must be congruent. It is the client who owns the problem and solution—the consultant must always focus on creating an environment which will lend itself to problem-solving and refrain from removing the client’s problem. Go with the flow: all client systems and group processes embody different cultures and approaches. Therefore, motivation and change mechanisms must be accessed through the system abilities. Timing is crucial: interventions need always to be well-timed and situated. Be constructively opportunistic with confrontive interventions: taking interventional risks while going with the flow is a necessary balance for accomplishing goals. Everything is data; Errors will always occur and are the prime source for learning: Errors are inevitable and often illicit reactions from which the consultant receives feedback and is able to understand more deeply what is needed. When in doubt, share the problem: actively involve the group in the process of diagnosis and intervention. Schein’s facilitative process consultation is truly revolutionizing as it takes a humanistic perspective to remedying issues in the group or individual contexts. And, in light of our individualistic, behavioral based and cognitively addicted world, a humanistic consultation process at the G-20 Summit would seem like a natural solution. With a variety of needs, problems and conflicting interests, the process consultation method is a perfect fit—allowing an unbiased consultant—to constructively assess the differing realities of each country and intervene through the leaders in a way that shares responsibility for problem resolution. The consultant would be skilled at guiding the top twenty leaders in a group process involving problem diagnosis, assessment, and intervention in line with set goals and agreed upon actions. With the failure of past G-20 summits and other similar summits, world leaders and banking experts from around the globe are in great needing of further incorporating ideas such as, the process consultation, into their interactions and decisions. Undeniably, the twenty first century has brought problems of every kind—and the successful resolution of these issues—rather financial or personal –depends on the implementation of a group process consultation theory.